Duty officers are additional members of your crew. They should not be confused with bridge officers who are assigned to bridge stations and the away team. Duty officers cannot be customized and are used completely differently than bridge officers. They are generally used to provide bonuses and complete assignments. I'll break down the duty officer window for you. The purpose of duty officers it to give you more to do in the game and help you earn extra bonuses. Some assignments provide buffs, others provide equipment, and they all provide great rewards such as experience, dilithium, energy credits, and more. This is definitely something you want to do, especially since it only takes a few minutes to assign duty officers to assignments. Overview: The first tab is Overview which provides some short-cuts to different parts of the duty officer window and also lists the eleven commendations you can earn. Each commendation has four tiers and they all have different rewards, including a free duty officer. Click on each one while in the game to see the bonuses for each tier. I always recommend reaching tier 4 in the Diplomatic commendation first because it provides transwarps to different parts of the galaxy. Those are always useful. 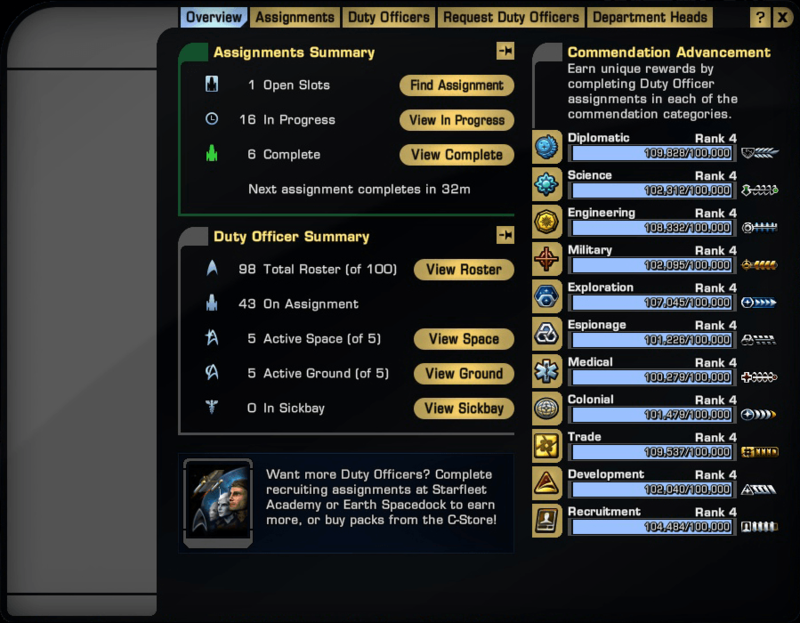 Assignments: The assignments tab is where you assign duty officers to complete various missions. Current Map and Personal both list duty officer assignments that are available in your area. In Progress and Completed are pretty easy to understand. The Assignment Log lists assignments you've completed. Assignment Chains shows assignments that have different parts. You can complete the entire chain of these assignments for a special reward. Duty Officers: The third tab is Duty Officers and, you guessed it, this lists your duty officers. Two tabs that I want to talk about are Active Space and Active Ground. Here you can assign a few duty officer ships to your ship which provide bonuses. Each duty officer has a different bonuses so read them and see which work best for you. Request Duty Officers and Department Heads: The Request Duty Officers tab allows you to buy duty officers with Zen. Don't worry, this isn't the only way to get new ones. Finally the Department Heads tab allows you to assign bridge officers as department heads. They provide recommendations for your duty officer assignments. It's a nice way to role play with your bridge officers. There are a number of ways to get duty officers. First, as mentioned above, each tier of a commendation gives you a free duty officer, but also unlocks others. You can buy them with dilithium. At Starfleet Academy and the Klingon Academy there are NPCs which have recruitment assignments you can use them to get free duty officers. There are some duty officer assignments and chains which also provide duty officers as a reward. If you're in the market to buy some you can check the Exchange, or if you're in a fleet then visit the various fleet holdings and buy them with Fleet Credits.